The only pearl fit for a princess but made for a true lady. 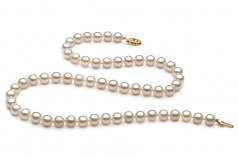 The 6-7mm size is perfect for any age, from the young ladies who are going to their first prom to the mature woman who is looking for that just right pearl necklace to compliment her business wear. 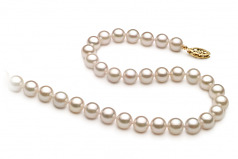 The Chinese Akoya Pearl Necklace just fits. With the AAA near perfect shape pearls, the shimmer and shine of the AAA mirror like lustre glisten with each subtle move. The quality and overall grade of this piece is truly magnificent. Keeping it safe and secure is never a worry. Each pearl is hand strung onto a fine double knotted silk thread with each pearl being separated with a hand tied double knot. A solid tight way of ensuring that no two pearls ever touch, rub or damage the surface of another neighbour. Keeping this sophisticated and elegant White Chinese Akoya Pearl Necklace in place for the evening is the modern clasp. 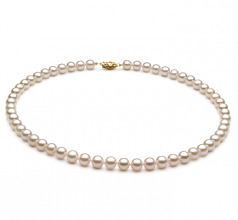 One beautiful white pearl necklace fit for any lady in your life.